WHEREAS EI has been weakened to the point where fewer than half of the unemployed receive EI at any given time because fewer workers qualify and benefit weeks are reduced. Yet a healthy EI system is the most powerful of all economic stabilizers, reducing the shock of job and GDP losses during downturns. 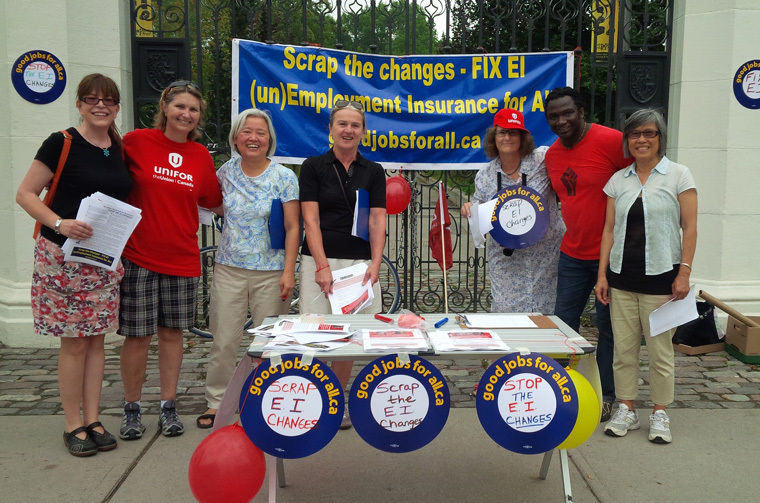 WE URGENTLY PETITION PARLIAMENT to introduce these changes to Employment Insurance. We fund EI and we expect it to be there when we need it. 1. 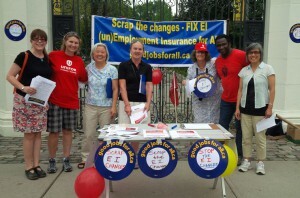 Rescind all 2012 and 2013 Budget measures related to Employment Insurance. 2. Provide Temporary Foreign Workers with meaningful EI entitlements. Increase access by reducing qualifying hours to 360 hours in all regions of Canada. Increase duration to at least 50 weeks in all regions and provide a Special 52 week Extension when national unemployment exceeds 6.5%, paid from federal general revenues. Provide EI income benefits so long as workers are in approved training. Increase EI to at least 60% of earnings using workers’ 12 best weeks. Raise the maximum benefit. Eliminate severance pay allocations and 2 week waiting period. 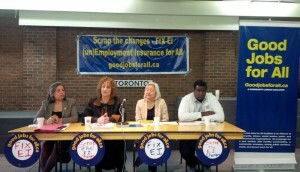 The Good Jobs for All Coalition launched its campaign against the EI cuts at a packed forum on June 20th. For everyone who came out to the event, it became obvious that people in greater Toronto need to start fighting to defend what is left of this vital social safety net. Only 1 in 5 unemployed Torontonians received Employment Insurance (EI) benefits at any given time last year and the recent changes by the Conservative government will only make matters worse. The new EI rules require 75% of EI claimants to accept work at a 20-30% pay cut, in a job outside their current profession, after just six weeks of job search. “Those changes will further erode our confidence in the safety net long considered one of the keystones of Canadian democracy” explained Tam Goossen, co-chair of the Good Jobs for All coalition and moderator of the forum. The evening began with a panel of speakers from Toronto, Quebec and New Brunswick, including Kenny Hoosein, Steelworkers Job Action Centre, Armine Yalnizyan, Canadian Centre for Policy Alternatives, Patrick Rondeau, Conseiller regional Federation des travailleurs et des travailleuses and Daniel Legere, New Brunswick Scrap the Changes Resource Committee. Kenny spoke passionately of the experience of unemployed workers, while Armine provided a broad analysis and historical perspective of EI. Patrick and Daniel shared their experiences in organizing huge rallies in their communities, and called on Torontonians to build mass support to restore EI for all jobless workers. Following the panel the audience of community and union members spoke of their experiences with EI and the need to Stop the Changes and Fix EI, so all unemployed workers have access to an insurance that they pay into – an insurance to take them through the challenging times between jobs. Join Us for a Special E.I. Teach-In! What’s driving low-wage work in Canada? How does it affect all of us? Are there alternatives? What’s the impact of EI changes on the unemployed, younger workers and workers in precarious jobs? What’s their response? Quel est le motif derrière le travail au rabais au Canada? Quel est l’effet sur nous tous? Y-a-til des alternatives? Quel est l’impact des changements dans l’assurance-emploi sur les chô meurs, les jeunes et les tavailleurs précaires? Quelle est leur réponse? This is not just an issue for Quebec and the Atlantic provinces. The devastation of the EI changes will be felt across Canada, in many sectors and in big cities as well as rural areas. They will add insult to injury since only 40% of unemployed workers are actually receiving EI benefits. The most vulnerable workers will bear the brunt of these changes. This is part of a cheap labour agenda that is creeping like a cancer into the fabric of our society. The Harper government’s attack on working people is evident everywhere, from its new anti-union legislation to the green light it is giving to discriminatory wages for Temporary Foreign Workers. It is unjust. It is outrageous. Your mobilizations are truly impressive and have inspired us to launch our own fight-back campaign and to take action to build public awareness. Inspired by these actions, the Toronto-based Good Jobs For All Coalition has announced the launch of its own campaign in the Greater Toronto area. “The impact of the EI changes will be felt right across Canada in many sectors and in big cities as well as rural areas. It’s not just an issue for Quebec and Atlantic provinces. These changes will be acutely felt here in the GTA too,” Coalition co-chair Tam Goossen said. The Good Jobs Coalition which represents more than 30 community and labour organizations in the Greater Toronto Area has also sent a message of solidarity to the demonstrations in Montreal and Edmundston, New Brunswick. The Coalition identifies the attack on workers’ EI rights as “part of a cheap labour agenda creeping like a cancer into the fabric of our society” including the government’s new anti-union legislation and green light to lower wages for Temporary Foreign Workers. • Extended benefit weeks to provide continued income benefits for workers in approved training programs, among others.